Pirates have always been said to “Fly under the black flag.” But what does that mean? Why a black flag? Why is the flag significant at all? During the Golden Age of Piracy, flags were a primary means of communication between ships. Some flags were used by navies to signal orders, reports or maneuvers. These were kept secret, the codes written down in codebooks, weighted so they could be thrown overboard in case of capture. Other flags were an international means of communication, understood by all. One of these was the white flag. A ship or person carrying a white flag signaled an end to hostilities, usually temporary. Under a white flag, the leaders of two groups might meet to make demands, discuss terms for surrender, or to make arrangements for humanitarian efforts, such as caring for the wounded, exchanging prisoners or getting civilians clear of the fighting. Respecting a white flag, at least long enough to reply “Go away!” was (and is) a requirement of so-called civilized warfare. The opposite of the white flag was the black flag. A black flag signaled an opening of hostilities. A ship approaching the distant outpost of a hostile nation might fly a black flag to announce formally that the two nations were at war, and battle was about to begin. 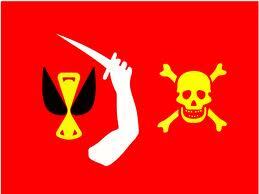 Pirates were quick to adopt this signal as a personal standard. Most pirates considered themselves “at war with the world” and had no problems announcing the fact. The black flag also offered a warning. Fight or surrender. We’re not here to negotiate. Pirates also had a vested interested in making their message as frightening as possible, and they used graphic designs that would be familiar to their viewers. 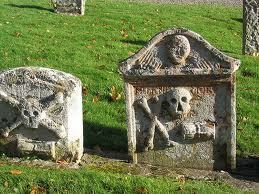 At the time, a skull and crossbones, or death’s head, was a common motif on grave markers. As a religious symbol, it was supposed to remind those visiting the grave that life is short, but death lasts forever, thereby encouraging them to see to their own souls. 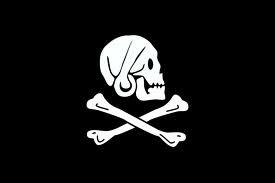 When a skull-and crossbones appeared on a pirate flag, it sent an obvious message that life could be very short, and standing up to a pirate was a good way to make it shorter. Some pirate flags had additional symbols on them – a dagger, representing violence, or an hourglass (another popular grave motif) symbolizing that the victim’s time was running out. The basic design might also be tweaked to offer additional meaning. Henry Avery, a working class sailor who found himself leading a rebellion against the men who had sold him and his crew into slavery, flew a flag that shows the skull in profile and wearing a bandana. Since working sailors wore bandanas, and officers did not, it seems that Avery meant to point out that he and his men were fighting for the rights of the lower classes (at least at first). Probably the most famous pirate flag is Calico Jack Rackham’s skull with crossed cutlasses, made famous in the Pirates of the Caribbean movies. Rackham was a noted hell-raiser, who never backed down from a fight, even when the odds were against him. The crossed swords seem to me to be a challenge to fight. An arm carrying a sword was another item that appeared often on pirate flags. Christopher Moody’s flag featured the raised arm, hour glass, and skull. The three images appear on a red background. Henry Avery also occasionally flew a red flag. Red was another color used often by pirates, as a red signal flag communicated the intention to go into battle immediately. Some pirates showed Death as a full length figure. The famous pirate Bartholomew Roberts flew several flags, one of which was a picture of himself, standing on a pile of skulls. Another showed him standing in company with Death. Together they are raising an hourglass. Roberts was arguably the most successful pirate of all time, and his ships probably absorbed a certain amount of name recognition from their famous captain. It’s important to remember that the production of these flags was crude. Pirates couldn’t hire flag-makers in port. They produced their products on the ship, out of materials they had on hand. A piece of sail cloth might be blackened with tar, then painted with whitewash to produce an image. 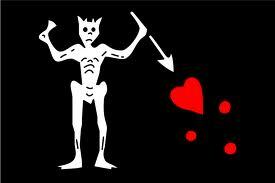 Looking at the superior image on Calico Jack’s flag, I wonder if Anne Bonny might have been responsible. Women had training to put images on cloth in the form of embroidery. Did Anne paint a pirate flag for her beloved Jack? And if history had gone differently, would she be remembered as the pirate Betsy Ross? Captain Morgan, Pirate or Hero?